The Sequim Lavender Festival is so popular that the Washington State Patrol issued travel advisories, advice, and warnings about what it will do to ferry traffic (see below). The Sequim Lavender Festival® celebrates its 22nd year in the heart of Sequim, Clallam County, Washington during the weekend of July 21- 22nd. Solely produced and managed by the member-growers of the Sequim Lavender Growers Association ™, the Sequim Lavender Festival® will include activities and attractions to delight visitors of all ages. 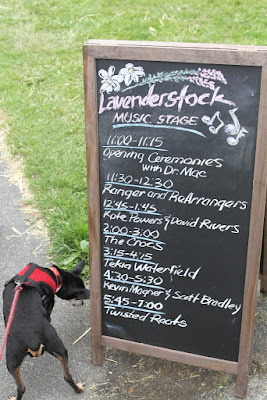 The Sequim Lavender Street Fair is located in Carrie Blake Community Park this year. This beautiful venue will host more than 150 crafts and lavender booths, a diverse food court, live music and more. Hours are Saturday from 9am to 7pm and Sunday from 9am to 5pm. Admission to the event is free and there is free parking at the entrance to Blake Ave. Watch for signs coming off SR 101 and directions to general parking and ADA parking. Sequim Lavender Growers Association™ members will offer original and hand-created gifts and personal care items produced from their Sequim lavender harvest at their vendor booths. The imagination is limitless when it involves the ancient and modern uses of lavender — from hydrating oils, lotions and soaps, relaxing eye pillows, culinary ingredients and pet apparel to the beautifully prepared lavender bouquets and loose lavender buds. And, of course, unique and hard-to-locate lavender plants will be available at the Street Fair and the farms. 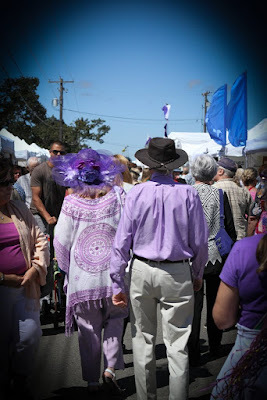 This lavender-themed event consists of a high-end juried street fair made up of all types of artisans with a wide variety of techniques and products. Offerings include photography, fine art, pottery, metalwork, leatherwork, carvings, jewelry, fibers, glass, pet supplies and precious minerals and rocks. Artisans from throughout the country make the Sequim Lavender Festival one of their must-do seasonal events. Our famous LavenderStock will take place at the James Center main stage and will feature live music and entertainment all weekend. Bring your dancing shoes on Saturday night for the “Street” Dance at the James Center from 7:00pm – 9:00pm featuring Black Diamond Junction. CLICK HERE to see the full lineup! Our Food Court should not be missed! A wonderful array of food is available to our visiting foodies. Don’t miss the BBQ, fish and chips, six flavors of lavender ice cream, street tacos, Greek and Thai food, coffee, donuts, kettle corn, elephant ears and more. There are several returning favorites and a couple of new things to try! CLICK HERE to see all the amazing food to choose from. The FREE Self-Guided Farm Tours will be held from 10am to 5:30pm all weekend, when eight farms and one commercial nursery are open to the public. Farms include: Blackberry Forest, Graysmarsh Berry and Lavender Farm, Nelson’s Duck Pond and Lavender Farm, Kitty B’s Lavender Farm, Meli’s Lavender, Earth Muffin Lavender, Troll Haven, and Peninsula Nursery. Pick up a Sequim Lavender Festival® map at any farm or the park for locations of these FREE farms, or download one off our website. Drive at your own leisure and pack a lunch to enjoy a full day of relaxation and lavender. CLICK HERE to see a Google Earth Map of the surrounding area. The Washington State Patrol Homeland Security Division would like to remind travelers of the Sequim Lavender Festival. This event draws thousands to the Sequim area each year to view the lavender fields in the area. Washington State Ferry (WSF) terminals are likely to see an increase in traffic primarily affecting the Seattle to Bainbridge and Edmonds to Kingston routes. It is important to follow signage leading up to and at each ferry terminal. Be mindful of the tally slip needed at the Kingston ferry terminal during heavy congestion and when the WSDOT signs advise. When the Kingston terminal is completely full, Washington State Patrol troopers hold ferry traffic outside of town at eastbound State Route 104 and Lindvog Rd NE. At this point, troopers will begin to issue boarding passes. The pass ensures your place in line as you travel through Kingston to the ferry toll booth to purchase a ticket. WSP troopers will be on the lookout for line cutters throughout the WSF system. As a reminder, please do not contact a line cutter yourself. Report to the HERO line (1-877-764-HERO) or advise WSF staff if this behavior is observed.